Southern California is home to majestic mountains, sparkling beaches, flourishing farmland and unique ecosystems that are as diverse as they are stunning. Make plans to explore the outdoors and appreciate the natural beauty around us. The Amtrak Pacific Surfliner can take you to awe-inspiring destinations and offer a front-row seat to breathtaking sights along the way. Enjoy scenic views of rugged bluffs at Torrey Pines State Park, the coastal wetlands of the San Elijo Lagoon Ecological Reserve, the rocky hillsides of the Santa Susanna Pass and the roadless, pastoral backcountry near the Vandenberg Air Force Base. The Pacific Surfliner stops at a number of beach towns – Santa Barbara, also known as the American Riviera, is one of the most popular. Just outside of the train station is the Moreton Bay Fig Tree, the largest fig tree in the U.S. From there, the beach is a short walk away. Visit the Santa Barbara Museum of Natural History Sea Center for close encounters with marine animals, and head to the harbor for some fun on the water. Oceanside is another great option, with wide sandy beaches, whale watching excursions and coastal bike paths. The hills are flourishing from the recent rains, making it a great time to head out on a hike. San Luis Obispo has a number of trails with panoramic views of ocean vistas. There’s also a great trail on the bluffs along the beach near the Carpinteria Station that ends at a harbor seal preserve! Catch an Island Packers cruise from Ventura Harbor and head to the Channel Islands. These islands are also known as the Galapagos of North America due to their diverse array of plants and animals, 145 of which are found nowhere else in the world! At Santa Cruz Island, you can hike high above the ocean with panoramic views, kayak through sea caves and even plan an overnight stay. Check out our Facebook album for more! Balboa Park is a must-see destination on any trip to San Diego. From the train station, hop on the MTS Rapid Bus 215 for a quick ride to Balboa Park. Enjoy more than a dozen gardens and 65 miles of trails, in addition to countless museums and the San Diego Zoo. Bring a friend along for the ride and save with our mid-week travel offer – book an adult ticket and get 50% off of your companion fare. Or, check out pacificsurfliner.com/discounts for our list of California Everyday Discounts. The 253 million passenger miles taken on the Pacific Surfliner last year resulted in a reduction of more than 91,000 metric tons of greenhouse gases – that’s the equivalent of 9.3 million gallons of gasoline being consumed! Our new Charger locomotives, which now power Pacific Surfliner trains, are among the cleanest in the nation, and produce 90 percent less emissions than the older locomotives we had before. All of our Café Cars have recycling containers. With thousands of beverages purchased from our Café Car each month, this is an easy way to make sure those bottles and cans don’t end up in a landfill! We locally source the food and beverages sold on the Café Car. The shorter distance required transport the food to our warehouse in Los Angeles reduces carbon emissions, as opposed to food that would have to be driven thousands of miles from other parts of the country. 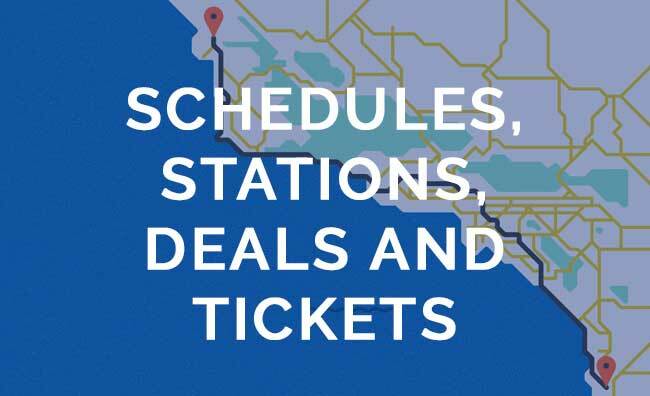 Plan your trip today at pacificsurfliner.com. Previous Post: Take the Pacific Surfliner and save on Disneyland® Resort Theme Park Admission!